Taking Off on Our Own Octoberfest! Fall colors are peaking here in Wisconsin and it’s time to hit the road! We’re heading out on our very own Octoberfest (spelled with a “c” so as not to be confused with Oktoberfest, although certainly just as fun). To commemmorate this great event, I’ve concocted a bit of a promotional poster. Yep, I love the work I get to do. Back in February, my husband and I celebrated our 35th wedding anniversary. I wanted to do something special for my guy, so for the past eight months I’ve been planning this ultimate Octoberfest. Now ladies, you may think a romantic weekend in Galena, IL is the thing to do. Or a tropical escape to the Caribbean. Better yet, how about a cultured European voyage (said in a French-esque accent)? I admit all of those sound fun. But based on the enthusiastic response I get whenever I tell a man about the trip I’ve planned, a brewery tour is what the male species would really like to do. 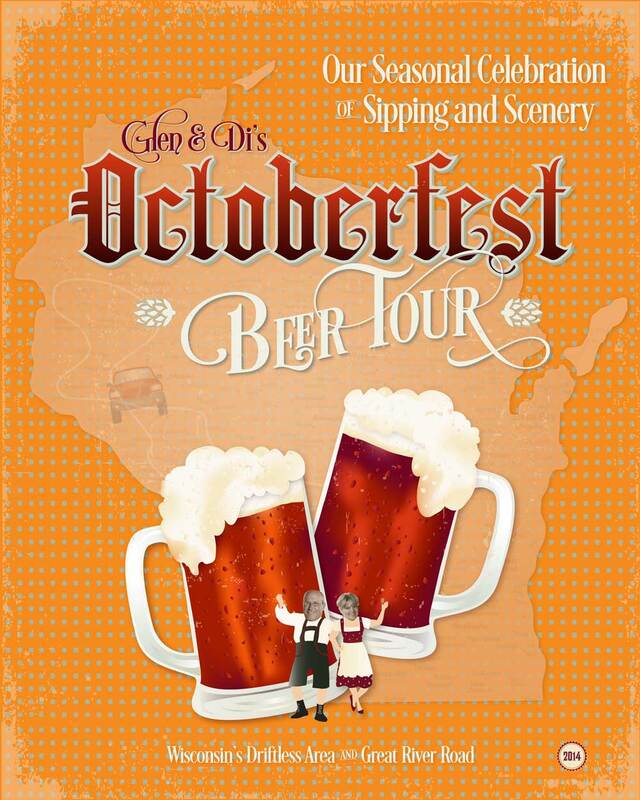 So that’s our Octoberfest—a good ol’ Wisconsin tour of breweries crafting the seasonal Oktoberfest style of beer. Sound life fun? You bet! A full of week autumnal sipping and scenery! Thanks Cindy! It looks like we’ll have gorgeous weather and beautiful autumn scenery! Nice graphic! I can’t think of a better way to celebrate…. Have fun!